Russia’s second largest city is battered by the hurricane. St. Petersburg has escaped relatively unscathed from a hurricane-force storm, which killed at least 13 people in Europe and caused massive disruption in Britain, France and the Netherlands. The St. Jude storm had lost most of its power on its way to Russia, but it still managed to cause problems in St. Petersburg and the surrounding Leningrad Region. Gusts of wind reached 55-62 miles per hour, with 15-foot waves in the Gulf of Finland and Lake Ladoga. 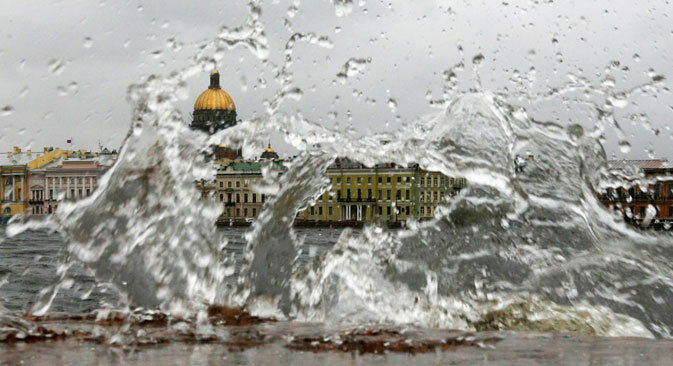 The St. Petersburg department of the Emergencies Ministry had decided to raise the floodgates that protect the city, expecting a water surge of up to 200 centimeters (6.5 feet) in the Neva River. In the end, however, the water level rose only by 80 centimeters (2.6 feet). The Emergencies Ministry department in Leningrad Region is already counting the cost of the damage. “A total of 237 towns and villages in Leningrad Region, with a population of 11,500 people, were left without power,” the department stated. The damage in St. Petersburg itself, however, could have been much worse. In Krasnogvardeisky District, gusts of wind destroyed the summer terrace of a local cafe and toppled several trees. In the north of the city, trolleybus services were suspended because of damaged overhead power cables. The hurricane was named St. Jude because the day of its origin, Oct. 28, is celebrated as St. Jude's feast day by the Catholic Church. The storm first battered France and Britain, where tens of thousands of homes were left without power, flights were canceled and train services suspended. Germany and the Netherlands have also suffered from very strong gusts of wind. At least 13 people were killed. On the night of Oct. 29, the storm reached Latvia, where it left several towns without power and then moved on to Russia. “Speaking of the situation in St. Petersburg, we made our forecasts back on Friday based on the assumption that the floodgates would have to be closed,” the expert says.